You may want to provide your principal companies with details of sales orders received or pending, payments pending or received, goods in transit or in-store and many other day-to-day transactions. As an independent business entity you want to protect your company's competitive advantage in the market: filter voucher type in Tally.ERP 9 helps you to segregate data before sharing. Let us consider two situations - Data Synchronisation within your business enterprise: Your branch may be doing sales, purchase of items, storage and movement of those items, shipment and collection. From Head Office you need only information pertaining to sales & collection. While you might have operated by receiving the full copy of all transactions from your branches, now you can receive only the relevant transactions that you want to consolidate at the Head Office level. 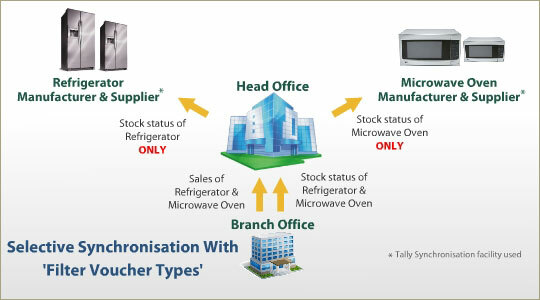 Second situation - data sync of your business with other businesses: Let us examine a case where You, a retail house, hold items such as refrigerator and microwave oven manufactured by different principals - ABC and PQR. You want to share the sales and the stock in hand status to your principals. What principal - ABC sees must be only the refrigerators sold and in stock, not information pertaining to ovens from PQR. This is now possible with Tally.ERP 9 Selective Data Synchronisation.